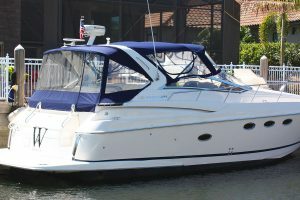 Boat curtains – side curtains, aft curtains, and connector curtains – are used to enclose and protect a vessel from the elements and, when necessary, the people inside. These boat enclosures can take a beating, often spending long days baking in the sun or being whipped by wind and rain. AmeritexDirect can provide replacement side curtains, aft curtains, connector curtains, and window curtains for boats that will attach to your existing Bimini top or camper top. We’re happy to replace entire boat canvas enclosures at once. Or, maybe, one side of your boat has seen more exposure to mother nature than the other? Then we’ll gladly make you one boat curtain at a time. All boat curtains will be custom made to order in our state-of-the-art facility. And only AmeritexDirect curtains will match and fit like the original. That’s because, if you can locate your manufacturer and model on our easy to use quote form, we made the original canvas supplied when your boat left the boat builder for the dealership.